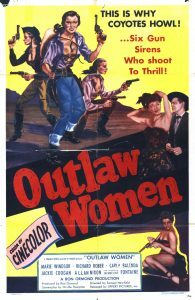 Barely feasible story about outlaws robbing a bank shipment is stretched past the point of interest by film’s end. Some interest may be generated, though, by the film’s unusual setting — a frontier town owned and governed by women. Their leader (Windsor) refuses to co-operate with the outlaws, leading the women to consider robbing the shipment to protect their investment. The audience I saw it with (here in Oakland, CA, where Will “The Thrill” Viharo is one of the only guys in the world who will show movies like this to a live audience) reacted positively to Windsor and her butch right-hand lady (Hart), but mostly with boredom towards the tired story, stilted dialogue, and substandard directing and photography (in Cinecolor, which on this rapidly disintegrating print looks like 1920s 2-strip). Some points of interest, but nothing exceptional. Pales in comparison to the similarly themed “Johnny Guitar” (which was made by somewhat more ambitious filmmakers).